2. Make a pilgrimage to the Deserted Village at Slievemore, a haunting reminder of times past. Comprising some 80 stone cottages located at the foot of the majestic Slievemore mountain, the Deserted Village offers a fascinating insight into life on Achill in former centuries. 3. Swim on the extraordinarily remote beach at Annagh, a most elusive beauty spot featuring a fine beach, and the lowest corrie lake in Ireland. Annagh is so hard to reach that it is accessible only to hillwalkers or sailors. Enjoy with care! 4. The Atlantic Drive comprises over 40km of breathtaking coastal scenery that is ideal for touring in a car, and even better by bicycle! Enjoy! 5. Visit Granuaile’s Tower at Kildavnet on the south east corner of Achill Island. The tower at Kildavnet is thought to have been constructed by the Clan O’Malley in about 1429, but is associated locally with a descendant of the original builders, Grace O’Malley or Granuaile. This legendary pirate queen is thought to have been born around 1530 and died in about 1603. The Tower at Kildavnet is one of a series of such strongholds that Granuaile established along the western seaboard (she is said to be buried in a similar tower on Clare Island) as she dominated the waters during the 16th century. 6. Visit Achill Heritage Centre in the old BPO (Bunnacurry Post Office), learn all about Achill Island's rich and vibrant history. See how people lived 100 years ago, see a traditional Achill cottage. Bring home a keepsake of your holiday on Achill or a gift for a friend from the gift shop. 7. You will find traditional music every night of the week on Achill. Ask around and find out whats happening and where, and enjoy wonderful traditional music in the most convivial and authentic of surroundings. You may even get to speak a little Irish too. 8. We welcome you to participate in any or all the watersports Achill has to offer from a kayak excursion out on keel lake to a kite surfing lesson. Keel beach has a large number of qualified, proffessional watersport operaters to choose from. 9. A newly opened Quad track is situated beside keel lake and caters for ages 7 and older. 10. Achill offers a 9 hole golf links course in a spectacular location at Keel that is open to visitors at a reasonable rate. A nine-hole pitch is also available on the grounds of The Valley House. 11. The artistic heritage of Achill is continued in a number of painting and traditional art schools including the highly respected Scoil Acla Summer School The heritage of Achill is also explored by the Achill Archaeological Summer School, which is currently undertaking an extensive survey of the Deserted village at Slievemore. During the summer, this School regularly holds informative talks and slide shows at its base in Dooagh. 12. The Atlantic waters around Achill Island and the Curraun Peninsula are home to a wide range of sealife and varieties of fish, making the area one of the best sea angling destinations in Ireland. Whether sea angling from a charter boat or casting from the shore, fishing on Achill is a popular and - often - highly rewarding outdoor activity. 13. 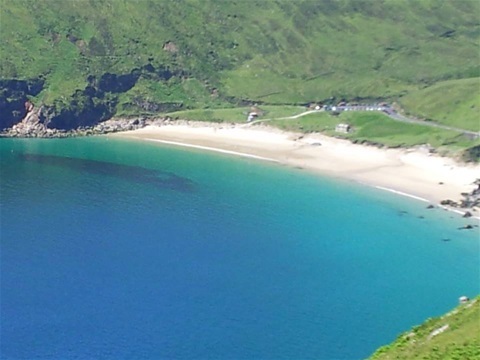 Achill is a walkers paradise and offers everything from a leisurely stroll to the most testing of hill walks, much of the higher land here is held in commonage, so you are free to explore the isolated splendour of mountains like Slievemore and Croaghaun. 14. Horse riding enthusiasts will find endless adventure as they trek inland to places like the Deserted Village or let loose with a gallop along the sandy Keel Beach. 15. Cyclists can really test their legs when they tackle the Atlantic Drive, a road route of hairpin bends and steep climbs which falls away dramatically to rocky cliffs and waves crashing on the rocks far below.